Do you and your pets love Halloween? Show us your furry friend’s best Halloween photo. It can be your dog howling at the moon, your Orange Tabby playing with the pumpkin, or even your pup having fun in his favorite costume! Use your imagination and you could win an Adopt-a-Pet.com swag bag and a chance to be featured! 2. Upload a Halloween inspired photo of your pet to your preferred social media account (make sure your account is set to public during the contest period for your entry to count). Make sure you are not using makeup or dyes on your pet or using a costume that can harm them in any way! We want to see all of your pet’s spooky sides so feel free to enter often and with multiple pets! The contest will run October 4, 2017 through November, 4, 2017. Submissions received will be judged based on creativity, originality, if your pet seems like they are having fun, photo quality, and adherence to the contest rules. Pets in photos should be in a safe and relaxed environment, and you should not place makeup or dye on your pets. Please do not post photos in situations that could be harmful or stressful to your pets. If they are not having fun, don’t do it! Photos must be visible to the public. Entries must adhere to the Instagram, Facebook, and/or Twitter guidelines. All photos must be original for entry to count. One chosen winner will receive an Adopt-a-Pet.com goodie bag and will be featured on our blog and social media channels. Multiple stand out entries will be featured on social media throughout the contest period. 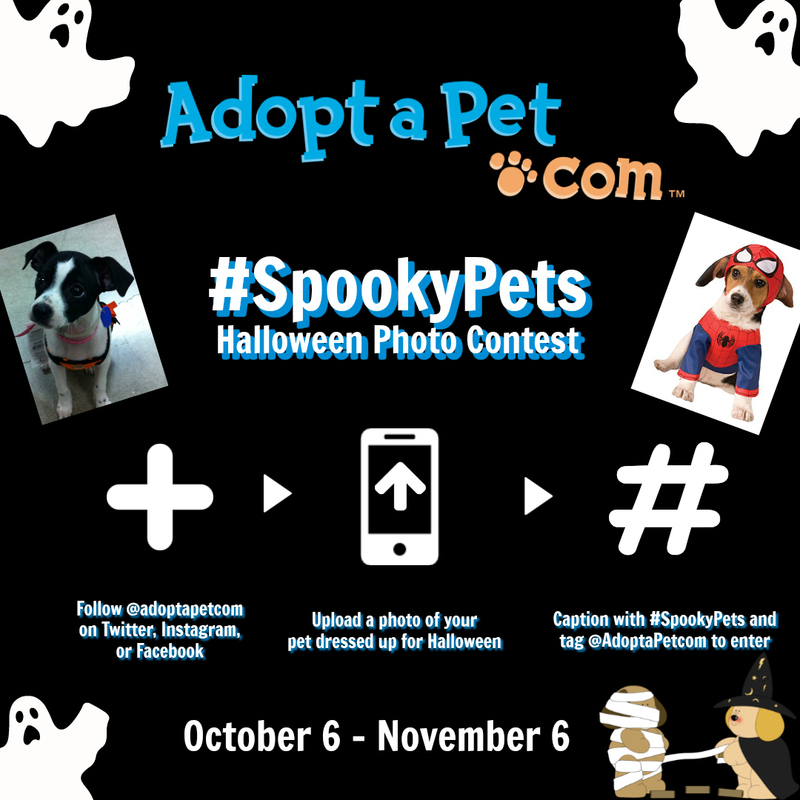 PROMOTION DESCRIPTION: The Adopt-a-Pet.com Spooky Pets” Halloween Photo Contest (the “Contest”) begins on or about October 6th, 2017, at 12:01 a.m. Eastern Time (“ET”) and ends at 11:59 p.m. ET on November 6th, 2017 (the “Contest Period”). To enter the Contest, upload a Halloween themed photo of your pet to your Facebook, Instagram, and/or Twitter using the hashtag #SpookyPets (each photo, a “Submission”). At the end of the Contest Period, one (1) Grand Prize winner will be selected from all eligible Submissions received during the Contest Period, as more fully set forth below. By participating in the Contest, each entrant unconditionally accepts and agrees to comply with and abide by these Official Rules and the decisions of Humane America Animal Foundation, d/b/a Adopt-a-Pet.com, 310 N. Indian Hill Blvd., #800, Claremont‎, CA ‎ 91711, (“Sponsor”), which shall be final and binding in all respects. ELIGIBILITY: The Contest is open only to legal residents of the fifty (50) United States, the District of Columbia who are at least eighteen (18) years old at the time of entry. Officers, directors and employees of Sponsor and its parents, subsidiaries, licensors, affiliates, distributors, retailers, sales representatives, advertising and promotion agencies (all such entities and individuals referred to collectively herein as the “Promotion Entities”), and the immediate family members and/or those residing in the same household of each are ineligible to enter the Contest or win a prize. WINNER SELECTION: Sponsor (in its sole discretion) will select the Grand Prize winner from all eligible Submissions received during the Contest Period. The Prize winner will be notified through direct message on the platform he/she posted to (Facebook, Instagram or Twitter). Sponsor shall have no liability for any winner notification that is lost, intercepted or not received by the potential winner for any reason. If any potential winner does not respond within the time required by Sponsor, or if the winner notification is returned as unclaimed or undeliverable to any potential winner, such potential winner will forfeit his or her prize and an alternate winner may be selected. REPRESENTATIONS AND WARRANTIES/INDEMNIFICATION: Each person who enters this Contest (and his or her parent or legal guardian, if the entrant is under the age of majority in his or her state/province of residence [a “minor”]) represents and warrants as follows: (i) the Submission is the entrant’s own original, previously unpublished, and previously unproduced work; (ii) the Submission does not and will not violate or infringe upon the intellectual property rights or other rights of any other person or entity; and (iii) the Submission does not and will not violate any applicable laws, and is not and will not be defamatory or libelous. Each entrant hereby agrees to indemnify and hold the Promotion Entities harmless from and against any and all third party claims, actions or proceedings of any kind and from any and all damages, liabilities, costs and expenses relating to or arising out of any breach or alleged breach of any of the warranties, representations or agreements of entrant hereunder. PUBLICITY RELEASE: By participating in the Contest, in addition to any other grants which may be granted in any other agreement entered into between Sponsor and any entrant in or winner of the Contest, each entrant irrevocably grants the Promotion Entities and their respective successors, assigns and licensees, the right to use such entrant’s name, likeness, biographical information and Submission, and any individual(s) participating therein, in any and all media for any purpose, including without limitation, advertising and promotional purposes as well as in, on or in connection with the Website or the Contest or other promotions, and hereby release the Promotion Entities from any liability with respect thereto. PRIZES The Grand Prize winner will receive a Sponsor goodie bag containing a t-shirt, branded pen, and luggage tag. The Grand Prize winner and up to 10 notable entrants will also be featured on the Sponsors social media channels. The approximate retail value of the Grand Prize is $40. GENERAL PRIZE CONDITIONS: No cash alternative or prize substitutions will be allowed, except Sponsor reserves the right to substitute prize(s) or opportunities or comparable out-of-pocket cost value if any prize or opportunity listed is unavailable, in whole or in part, for any reason. The Prize winners shall be solely responsible for all federal, state and/or local taxes, and the reporting consequences thereof, and for any other fees or costs associated with the Prize. GENERAL LIABILITY RELEASE/FORCE MAJEURE: Entrants agree that the Promotion Entities (a) shall not be responsible or liable for any losses, damages or injuries of any kind (including death) resulting from participation in the Contest or any Contest-related activity, or from entrants’ acceptance, receipt, possession and/or use or misuse of the prize(s), and (b) have not made any warranty, representation or guarantee express or implied, in fact or in law, with respect to the prize(s), including, without limitation, to such prize’s quality or fitness for a particular purpose. Entrants will indemnify, defend and hold harmless the Promotion Entities from and against all third party claims arising out of or relating to Entrant’s Submission. Sponsor assumes no responsibility for any damage to an entrant’s computer system which is occasioned by accessing the Website or participating in the Contest. Sponsor reserves the right in its sole discretion to disqualify any individual who is found to be tampering with the entry process or the operation of the Contest or the Website and/or the Entry Site, to be acting in violation of these Official Rules, or to be acting in an unsportsmanlike or disruptive manner, or with the intent to disrupt or undermine the legitimate operation of the Contest, or to annoy, abuse, threaten or harass any other person, and Sponsor reserves the right to seek damages and other remedies from any such person to the fullest extent permitted by law. These Official Rules cannot be modified or amended in any way except in a written document issued in accordance with the law by a duly authorized representative of Sponsor. The invalidity or unenforceability of any provision of these Official Rules shall not affect the validity or enforceability of any other provision. In the event that any provision is determined to be invalid or otherwise unenforceable or illegal, these rules shall otherwise remain in effect and shall be construed in accordance with their terms as if the invalid or illegal provision were not contained herein. WINNERS LIST/OFFICIAL RULES: To obtain a copy of any legally-required winners list, send a self-addressed stamped envelope to 310 N. Indian Hill Blvd., #800, Claremont‎, CA ‎ 91711. All such requests must be received within six (6) weeks following the end of the Contest Period. These Official Rules will be posted on the Website.